Xiaomi was teasing India by showing its Mi Men’s Sports Shoes 2. 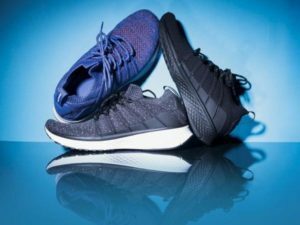 This is the official entry by the phone company into the footwear market in India, the Xiaomi Mi Men’s Sports Shoes 2 will be available on their official website. The phone company says that its shoes are engineered with the new 5 in 1 uni-moulding technology that allows 5 materials to combine, which will make the shoes, durable, slip-resistant, and shock-absorbent. Recently, Xiaomi also released its new Mi TV models, Mi Micro-USB cable, and Mi Soundbar in India. The shoes are now available on their official website, the price starts from Rs. 2,499, and the shoes have 3 colors which are blue, black, and gray. The shipping will start after March 15. The original price of the Xiaomi Mi Men’s Sports shoes 2 is Rs. 2999, but because of a special offer, it’s giving an Rs. 500 off. The sale will be only available for 10 days, Xiaomi believes that they will sell 5,000 pairs of shoes by this time span. Like we mentioned above that its shoes are engineered with the new 5 in 1 uni-moulding technology that allows 5 materials to combine, which will make the shoes, durable, slip-resistant, and shock-absorbent. The Mi Men’s Sports Shoes 2 use a PU supporting layer, cushion patch, TPU midsole balancing patch, vacuum press midsole, and synthetic rubber outsoles. The uni-moulding technology allows to keep the soles intact, which will make them more durable. The company claims that its 10-fishbone structure will give a comfortable feel, a better balance by giving arch support, and it even reduces the chances of getting sprains. They also say that the shoes are very comfortable and it uses a minimalistic design. In addition to that, Xiamo says that the shoes are made from a mesh fabric that allows its owners to wash them in a washing machine.